PHILADELPHIA—In 2013, FMC Corp., Univar and 65 Ohio-based pest management professionals (PMPs) collected and distributed 57 “provision packs” and more than 80 meals to four homeless camps in the Columbus area. In December 2014, the group expanded the drive to include Cincinnati and Cleveland, once again providing desperately needed supplies for Ohio’s homeless community. At Univar’s annual holiday open houses, held Dec. 16-18, PMPs donated flashlights, batteries, socks, toilet paper and cash. 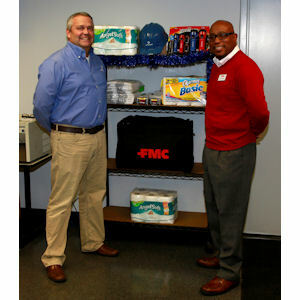 Univar staff promoted and coordinated the drive, while FMC donated 100 large duffle bags to the cause. “Many homeless are working and trying to save money for housing,” says Arnold Ramsey, Midwest market specialist for FMC. “Simple items like flashlights and duffle bags make a huge difference as they try to stay safe and protect their belongings while transitioning to a permanent home.” Ramsey has worked with the homeless in Ohio since 2008. Leading the effort once again were Kevin Behrens, regional sales manager for Univar, who spearheaded the endeavor, and Ramsey, who will distribute the supplies in the coming days. To contribute to a homeless shelter near you, visit www.homelessshelterdirectory.org.